Wings in Wonderland: Prima, Prima and o yeah more Prima! Hello again, So last month I admitted that I had a little trouble mixing brands when im creating and it wasn't until I came to post about this card that I realize I have sort of done it again......Whoops o well im only human. Anyway with that said take a look at my first ever easel card featuring (if you couldn't guess from the post tittle) a lot of Prima! Here it is all opened up! So where is all this Prima you ask? well the paper line and all but one flower (which is i am roses) are from the prima collection and so is the bling in my handmade flower. Also the canvas butterfly which I have inked with distress inks to bring out the resist is you guessed it PRIMA! Well ok so not everything is Prima but its pretty darn close, here are my actual supplies below. Prima: Fairy Belle Collection 6x6 pad, Delightful day flowers, Parchment Petals (scroll), Mulbury Flowers (Eminence), Resist Canvas (Printery), Say it in Crystals. Other: Ranger distress ink (Tea Dye) , Spellbinders Labels Seventeen, Martha Stewart punches (Doily Lace and Vine Trim) Tattered Angels glimmer mist, Kaiser craft wooden Butterflies (covered in Ranger dry fine glitter in platinum. O and im really sorry I cant remember where the frame comes from as I actually made it along time ago for another project but never used it (i painted it with blue and white paint and added some Tim Holtz Distress Crackle to it) Don't you love it when you use up scraps! Well as always I hope you like it and let me know what you think. Fabulous card, love the little dog and all your super embellishments, thank you for joining us for the Crafty Bloggers Network challenge and good luck. 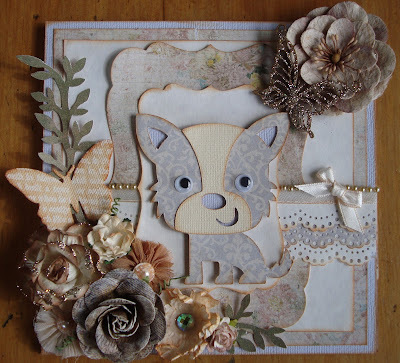 Gorgeous card - such a cute dog and beautiful flowers. Thanks for playing with us at AGOAC this week - good luck. Wonderful card...the flowers are stunning! Thanks for playing at 613 Avenue Create. Gorgeous card. The image is very cute and i love the pretty flowers. Thanks for joining Di's Digi Designs Challenge this fortnight. oh wow this is stunning. The blend of colours to give the vintage shabby chic style is just gorgeous.